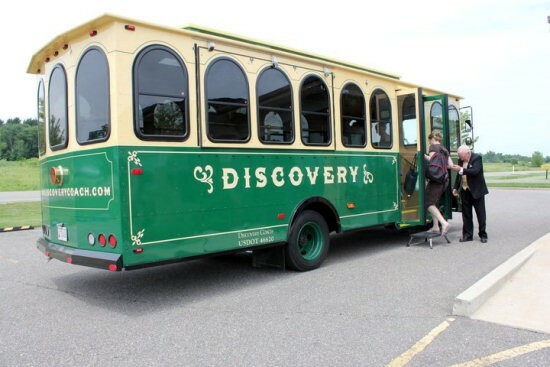 Since 1949, Discovery Coach has been a family owned and operated company based in Sheboygan, Wisconsin providing safe and reliable transportation for area groups, schools and corporations. Founded by John and Lucille Prigge and sons Jerry and Jim, the company is now owned and operated by the third generation of the Prigge Family. We take pride in our clean, comfortable and modern motorcoaches; professional and courteous drivers; and high level of customer service. 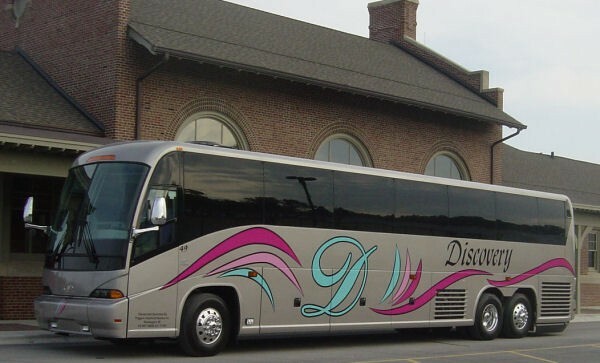 All of our coaches feature comfortable reclining seats, DVD/VCR with video monitors, large panoramic windows, restroom, and AM/FM CD stereos. All the comforts needed to provide a safe and enjoyable experience for your group. Our drivers are experienced professionals licensed by the State of Wisconsin. 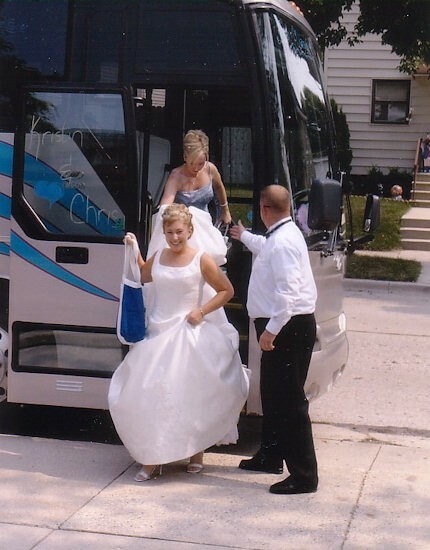 Many have over 20 years of driving experience and are well versed in dealing with tours, shuttles, weddings, baggage handling and treating your customers and employees with the utmost respect. 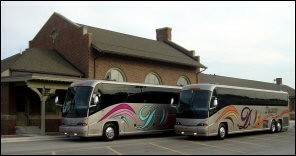 We have a complete motorcoach maintenance facility at our corporate headquarters to keep our vehicles clean and operating safe and reliable. Looking for an inexpensive way to transport your group? 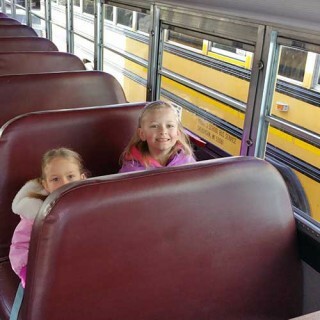 Our late model school buses are ideal for all kinds of groups and all kinds of charters. Our experienced drivers will make your group outing fun and easy!! Whenever your group needs inexpensive group transportation! We have a variety of school bus sizes including Orthopedic Buses with wheelchair lifts available!! Call for details. Please Note: We are limited on our service area and at times cannot provide school bus charter service that conflicts with our Monday-Friday Sheboygan Area School District routes. Prigge's School Bus Service has openings for full or part-time drivers. - Drive a school bus! - Daily route drivers needed NOW. Take PRIDE in providing a vital link to the education of today's children. No Experience - We Will Train You! Flexible Hours - Part Time! You can even work flexible days if needed. Ideal for Retired Persons, Moms/Dads looking for extra hours, Shift Workers and College Students. Must be 21 or older to apply. Discovery Coach has been providing safe and reliable motorcoach transportation since 1949. Almost any Group Travel Needs!! 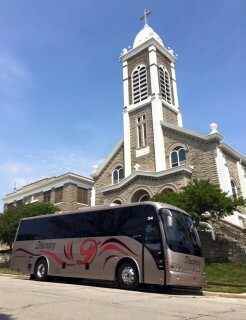 We feature wide-body deluxe 30, 48 and 56 passenger European style motorcoaches, a stylish 16 passenger mini-coach and 28 passenger vintage trolley coaches. Our drivers are highly trained and experienced professionals who will make your trip safe, comfortable and worry free!! (Please note some comfort features not available in Vintage Trolleys). 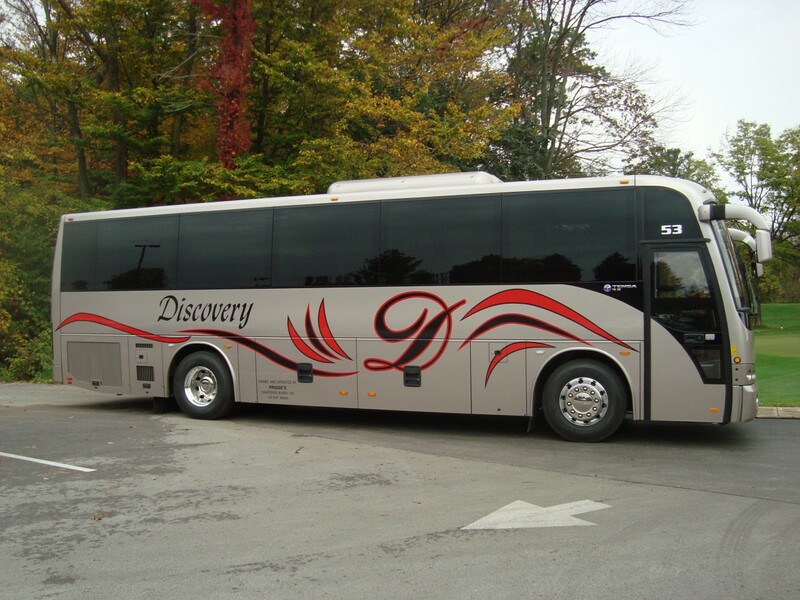 From the more spacious interior to a velvet-smooth ride, a Discovery motorcoach offers unmatched passenger comfort, conveniences, and safety. 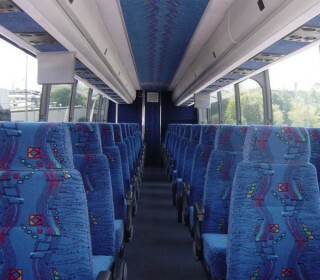 Standard features include soft, reclining seats, panoramic windows, individual lighting, climate control, DVD or DVD/VCR players with multiple video monitors, AM/FM CD stereo, and restroom. 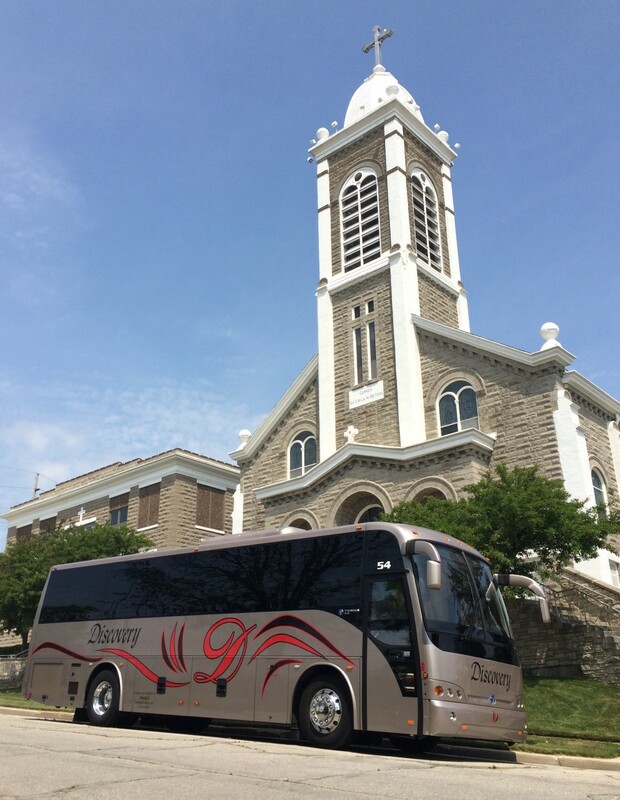 Whether a charter excursion, multi-destination tour, or conventional shuttle, the atmosphere aboard a Discovery motorcoach fosters a feeling of relaxation. Traveling on a state-of-the-art Discovery Coach will be an experience your group will want to repeat again and again. 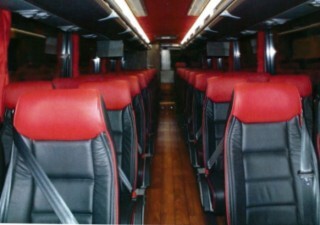 With factory trained mechanics and support staff, our motorcoaches are kept in excellent condition both inside and out. All drivers have cell phones so they can always be in contact with you en-route to and during your charter. Ask for details! 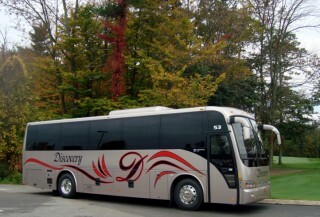 Discovery Coach has several motorcoach sizes and styles to choose from to fit the needs of your group. Please see each coach description below for the features of each style. 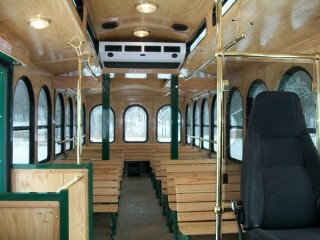 Due to the vintage nature of the Trolleys, they do not have most of the features listed above. 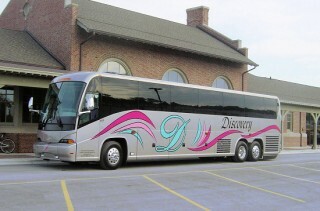 Our 56 passenger coaches are great for any and all charter uses. They provide passengers with the best panoramic views and all the latest in passenger comfort and convenience features.110 volt power outlets at every seat. Free Wi-Fi. 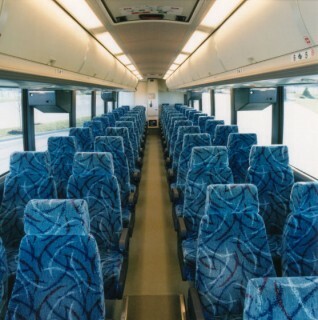 Almost identical to the 48 passenger coaches- great for when you need those extra seats! Our 48 passenger coaches are great for any and all charter uses. 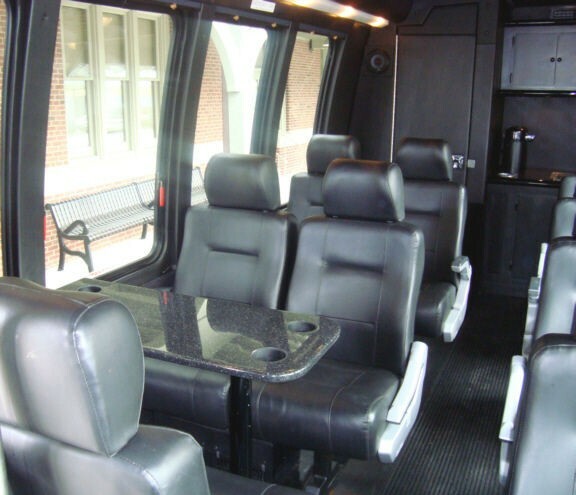 They provide passengers with the best panoramic views and all the latest in passenger comfort and convenience features.110 volt power outlets at every seat. Free Wi-Fi. We have 2 TEMSA TS 35 mini-coaches. 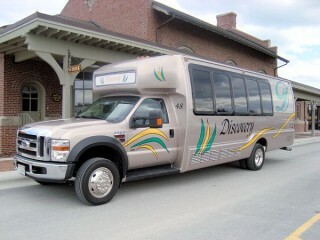 Great for any occasion or trip from local service such as weddings or convention shuttles to cross country touring. 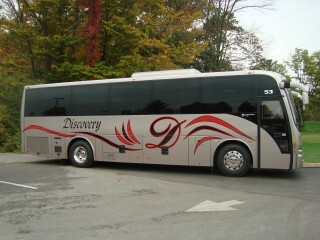 Ideal for a group looking for a smaller but high quality deluxe motorcoach with a smooth comfortable ride. 30 leather seats. Rich looking simulated wood floor. 110 volt power outlets at every seat. Free Wi-Fi. 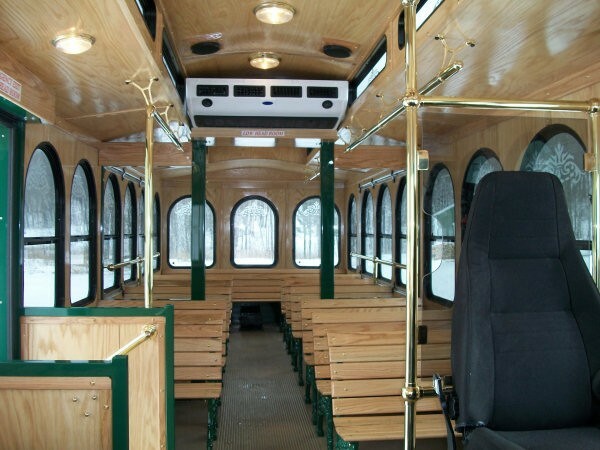 The 30 passenger coaches feature a serving galley in the rear of the coach including a built in ice chest! A smaller coach style that is ideal for weddings, sporting events, corporate outings, dinner excursions and short haul regional weekend getaways! 16 comfortable reclining leather seats, two tables with seats facing the tables for easy conversation, DVD player with 4 LCD Flat Panel Monitors and Custom Rear Serving Galley for entertaining. Free Wi-Fi. YES it does have a restroom. 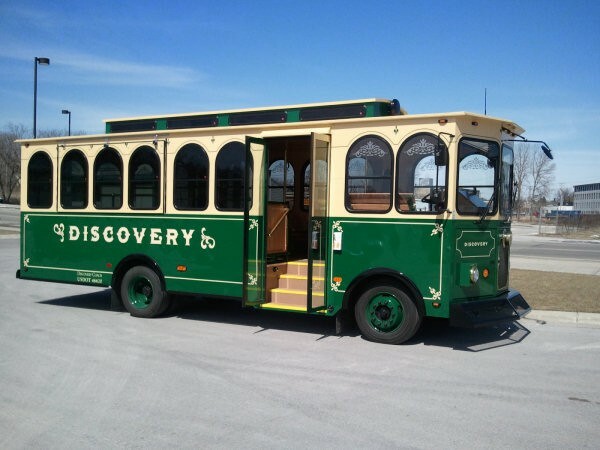 Fully enclosed 28 passenger Trolleys feature old fashioned styling and modern conveniences. Decorative wooden bench seating, wood interior and brass accompaniments will make you feel like you are riding in a street car of yesteryear. Air conditioning and heating systems will keep you cool in summer or warm on a crisp fall day. No restroom or Wi-Fi. 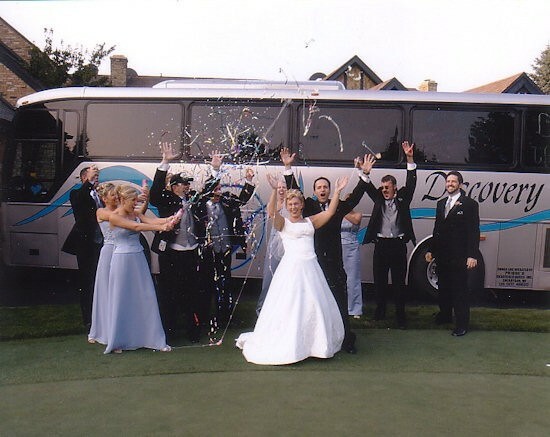 Make your wedding day transportation fun and easy with Discovery Coach! A Discovery Coach or Trolley can be a convenient and fun addition to your wedding day. Imagine getting everyone in your wedding party in one vehicle for the trip from the ceremony/church to picture taking and then to the reception. All of our coaches can be used for weddings. 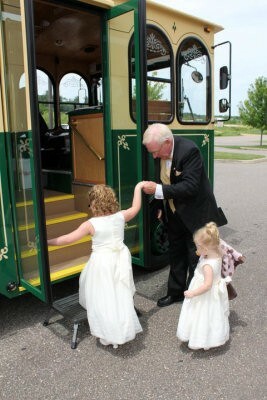 But the most popular for weddings are by far our Trolleys and 30 Passenger mini-coaches. Custom Serving Galley in the rear for easy entertaining! 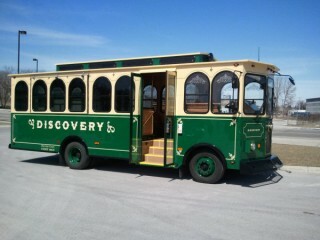 We now feature 2 fully enclosed 28 passenger Trolleys featuring old fashioned styling and modern conveniences. 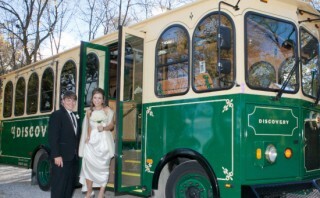 Trolley # 52 has an exterior porch that is GREAT for pictures of your wedding party! Almost anything you desire such as taking the bridesmaids to the hairdresser to church to picture taking, stop for drinks, to reception. Service Ends at your reception. 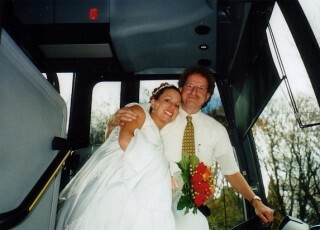 If you want reception to hotel shuttles and return service, we need to quote that separate from standard wedding service. We do not provide late night house to house service. Service must be to a hotel(s) or parking location. Champagne or any bottled/canned beverages are allowed. Food is permitted. Please try and use plastic glasses if possible. We do not allow smoking aboard any of our coaches or trolleys. Our SATURDAY WEDDING rates are based on an 8 hour minimum. 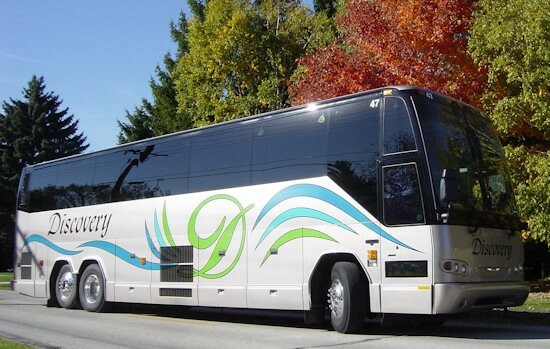 If you book the coach for 1 to 8 hours, the rate is the same. The time frame begins when the coach reports for your first pickup and runs continuously no matter what you have the driver doing until the end of service. How do I reserve a vehicle for my wedding? Call or email us for availability. We need just a few items of information about your wedding such as date, approximate time you will be using the vehicle, Ceremony and Reception locations and a time frame. We send you a contract. You have two weeks to send in your signed contract and a refundable $ 100 deposit to confirm your reservation. Final payment is due in our office 2 weeks prior to your wedding. We would also like to have all your details of your wedding day submitted with your final payment. How far can away can you travel to pick us up? We are located in Sheboygan, Wisconsin. We do MANY weddings in Green Bay, Milwaukee, Mequon, Port Washington, Appleton, Oshkosh, Manitowoc, Fond du Lac, Elkhart Lake and Kohler. If your wedding location isn't listed or you know it is more than an hour from Sheboygan, please let us know where so we can provide an accurate quotation. What about my Bachelor/Bachelorette Party? 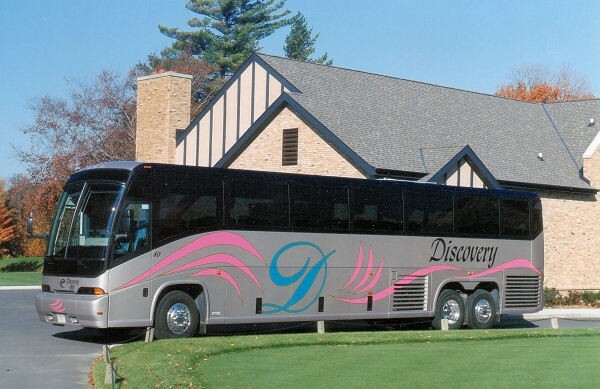 Sorry, we cannot accommodate requests for Stag Party, Bachelor Party or Bachelorette Party charters.